I really like my clear goggles for cold weather riding, but that's the problem. This year it has become dark during my commute without becoming cold enough to warrant the goggles, which can be quite warm when you're working much. So, I tried the clear safety glasses, and I must say I quite like them. 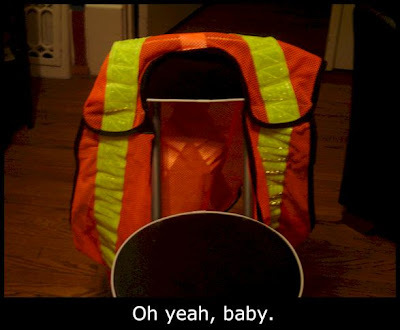 I must say that I like what the vest does, but I hate wearing it. It makes me feel like a nerd, which is totally stupid because Mutant Winter with her pink cables and plastic tub have already completely established that I AM a nerd, so why should I care? Perhaps I attach more importance to clothing; after all "clothes make the man", right? 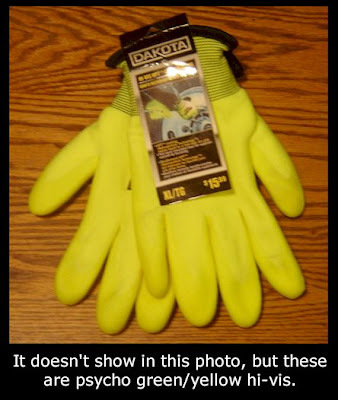 If that's true, do "gloves make the hands"? 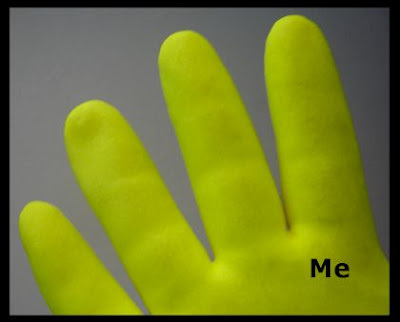 I've only had those $5 gloves for about a month! I must have super strong thumbs. Damn video games! 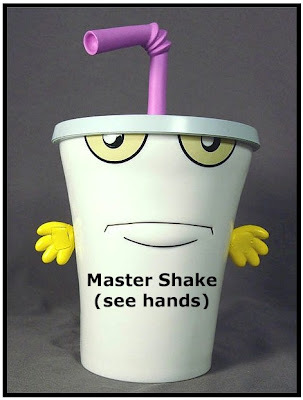 If you don't know who Master Shake is, shame on you. You are so un-cool. I didn't know who he was either, but a young colleague of mine said my hands looked like his in those gloves, so I looked him up. I don't get the channel needed to watch Aqua Teen Hunger Force, but I really wish I did... it seems like my kind of strangeness. The tragedy lies not in the fact that the truck driver didn't like me being where I was and using his air horn. The tragedy is that for reasons I can't explain, I lost my temper and flipped him off very clearly with my new hi-vis finger held high for his rear-view mirror. He didn't miss that signal, because he touched his brakes for no reason while I did it, like he might stop for a chat. I know lots of cyclists would consider that pretty normal, but it isn't for me. That was the first time in my many years of driving and cycling that I have ever given someone the bird, and therein lies the tragedy. I pride myself on keeping my cool and refraining from reacting to stuff like that dude's air horn. Civility is important and as my Mother would say, two wrongs don't make a right. Did he have an "OU" sticker on that truck. Well, at least he made a full lane change to pass. You were probably surprised - most professional drivers have a lot more class. Haha, very fun post, I was wishing I had something more than my normal glasses to protect my eyes this morning. 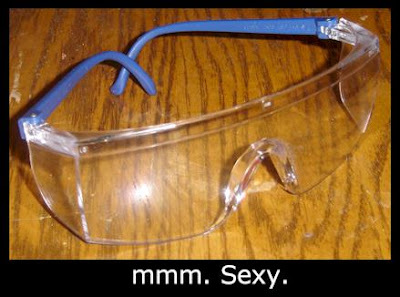 May have to see if I can get a pair of safety glasses to fit over them, that will up my already-high nerd factor. I dig the bright gloves, too. Too bad London can't create a good east/west bike path. There truly IS interconnectedness in the Internet Blogosphere. My own post for today, entirely by coincidence, has safety glasses AND high vis in it, albeit from a totally different POV than your post. I also have another post that I'll probably save until tomorrow, that talks about a jerky driver. Again, that post comes at that same topic as Rantwick from a different direction. Ironically, it involves my "OU" buddy that I encountered again today after I made that morning comment. if u had kept the lobster, the dump truck driver may not have realized you was givin' him the finger! 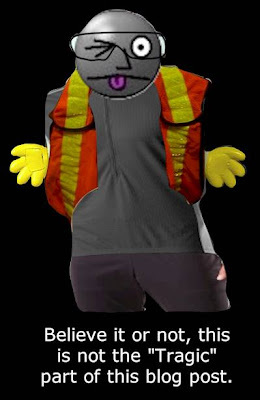 i like that vest and the cool gloves!